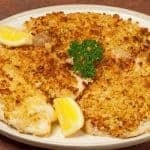 Quick-cooking tilapia fillets topped with a crispy coating of fresh breadcrumbs, garlic and parmesan cheese make a deliciously easy and healthful dinner. Preheat the oven to 400°F. Coat a shallow baking pan with nonstick spray and arrange the fish fillets in a single layer. In a small bowl, combine the breadcrumbs, garlic, 1 tablespoon of the olive oil, salt, pepper and parmesan cheese. Brush the fish fillets with the remaining tablespoon of olive oil, top evenly with the crumb mixture, patting gently with the back of a spoon to be sure it adheres well. Bake until the crumbs are golden brown and the fish flakes easily, 8 to 12 minutes. Garnish with lemon wedges and serve immediately.